Rock Island isn't the first company to build a 1911 downsized to fit the .380 ACP cartridge. I remember being a kid in the 1980s swooning over Colt's glossy catalog and its then brand-new Mustang. However, a design that was considered little better than a toy 30 years ago is now accepted as a serious self-defense option due to improvements in ammunition. It was in 2014 when I first saw the prototype of the Rock Island Armory .380 ACP 1911, and the Rock Island people were already calling it the Baby Rock. That nickname stuck. There are several models in what Rock Island Armory (whose parent company, Armscor, is a Filipino firm that produces a lot of 1911s, including some that have other brand names on their slides) now calls the BBR series. I secured a sample of the original full-size model to test. The Baby Rock doesn't look small until you put it side to side with a Government model .45 ACP 1911. But small it is, making it a great concealed-carry option. Without anything to indicate scale, a glance at the full-size Baby Rock will make you think you're looking at a five-inch Government model .45 ACP 1911. In fact, the Baby Rock is a seven-shot .380 ACP with a 3.75-inch barrel and is quite a bit smaller than the original 1911. The proportions are a little off from a GI 1911, and this is done deliberately. The Baby Rock's frame is just a tiny bit larger, so most people will still be able to get all their fingers on the grip. The rear corner of the frame has also been rounded slightly for comfort in the palm. The grip has a slightly more vertical angle than a traditional 1911, but most people won't even notice the difference. The pistol has all the controls of a full-size 1911. Tarr's only complaint was the lack of an extended lever on the already small thumb safety. The Baby Rock is a 1911 in every sense of the design. 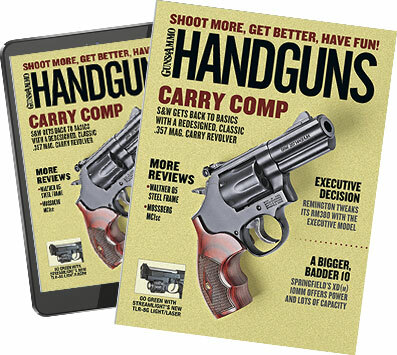 It is a single-action-only semiauto with the traditional 1911 grip safety and thumb safety. The grip safety has a bit of a beavertail, and my only real complaint about this gun is the lack of an extended lever on the thumb safety. The biggest functional departure you'll see from the original 1911 design with the Baby Rock is Rock Island's use of a pivoting spring-loaded external extractor instead of the original's internal tensioned model. I think this type of extractor is actually a more inherently reliable design than the internal style, which is why almost all semiauto pistols use them. There are aggressive flat-bottomed cocking serrations on the front and rear of the slide. The sights are all steel and dovetailed into the slide. The front sight is a serrated ramp, and the rear is an angled no-snag design. I think a bright dot on the small black front sight would be a good idea, as this pistol is primarily intended for self-defense. Paint or nail polish as a DIY high-visibility upgrade for the front sight would be an easy fix. Just remember to degrease it first so the paint sticks. The iron sights are a good size, although Tarr thinks the plain black front sight is a little easy to lose and would prefer a white or colored dot for defensive use. Unlike the modern trend toward polymer to reduce weight, the Baby Rock features mostly steel construction and weighs 23 ounces empty. You won't notice this weight in a holster, but you will when shooting, as its recoil is very controllable. While it's a bit large for pocket carry, the Baby Rock is still compact, and where it really shines is its width. The slide is just 0.79 inch. The rubber grips are the fattest part of the gun, and they come in at just 1.1 inches. With any kind of covering garment, this pistol just disappears. The trigger is curved aluminum with two holes and a serrated face. Trigger pull on my sample was 5.5 pounds, but it was so crisp and smooth it felt lighter than that. Reach to the trigger was short, and you'll find yourself using the tip of your trigger finger when shooting. The mainspring housing is the only other aluminum piece on this otherwise steel gun. It is vertically serrated. Notes: Accuracy results are the averages of four five-shot groups at 25 yards from a sandbag rest. Velocities are averages of 10 shots measured with an Oehler Model 35P placed 12 feet from the muzzle. Abbreviations: FMJ, full metal jacket; HP hollowpoint. The ramp on the frame and the barrel chamber are nicely polished to aid in feeding and reliability, and I didn't have any problems during my testing. The magazine is stainless steel with a non-tilt follower. The firearms market is flat, which is bad for manufacturers but great for the consumer. When it was introduced the suggested retail price on the Baby Rock was $459. Today, it is $460, which means when adjusted for inflation, the price has come down. As I mentioned, the .380 ACP today is a legitimate defensive caliber, and this diminutive 1911 is not only as cute as its moniker suggests and just plain fun to shoot, but it would also make a great carry gun for .380 and/or 1911 fans. 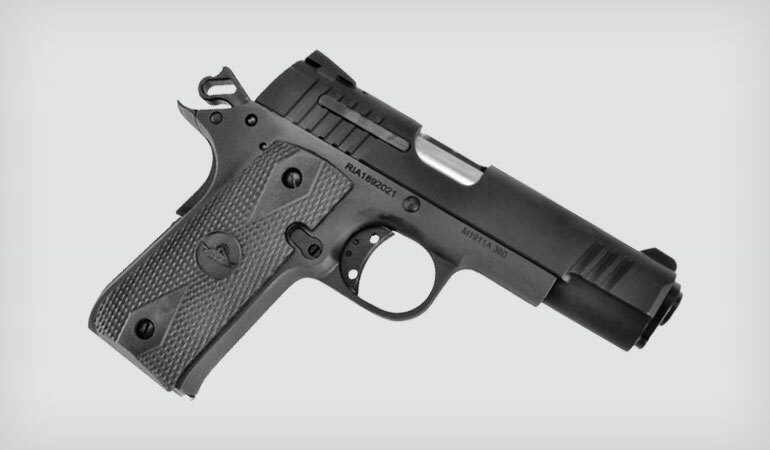 And if you want to downsize even more in size but jump up big-time in terms of power, the other member of the BBR series is the Rock Ultra CS Warrior- a .45 ACP with a 3.15-inch barrel, abbreviated grip and G10 grip panels.